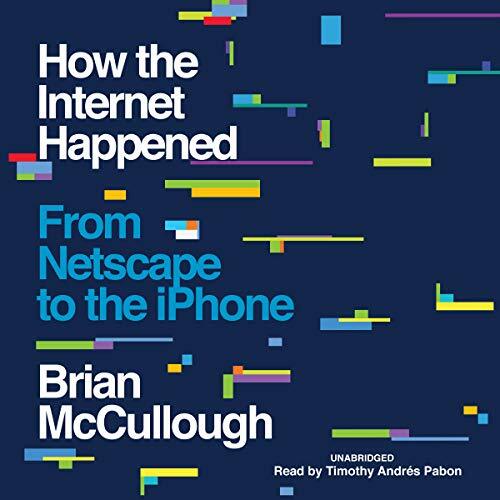 Tech guru Brian McCullough delivers a rollicking history of the Internet, why it exploded, and how it changed everything. Depicting the lives of now-famous innovators like Netscape's Marc Andreessen and Facebook's Mark Zuckerberg, McCullough also reveals surprising quirks and unknown tales as he tracks both the technology and the culture around the Internet's rise. Cinematic in detail and unprecedented in scope, the result both enlightens and informs as it draws back the curtain on the new rhythm of disruption and innovation the Internet fostered, and helps to redefine an era that changed every part of our lives. ©2018 Brian McCullough (P)2018 Blackstone Audio, Inc. I was there in Cham-bana (University of Illinois) in the early 90’s - and this is just as I remember it. Lots of extra little details too. Everything you ever wanted to know about how the Web got started - the deals, start-ups, phenomenal growth and eventual burst of the Dot-com bubble. This was a fascinating trip down memory lane for those of us old enough to remember the beginning of the Internet. I remember using and loving Netscape Navigator, before Internet Explorer became dominant. It's all here, from the beginnings in academia to the adoption of the masses: AOL, Myspace, the dotcom bubble and Web 2.0. All the major players are profiled as well, from Marc Andreesen to Marc Zuckerman. Expertly told and if you love audio, beautifully narrated by Timothy Andres Pabon. This is a history everyone should read since it covers many of the sites and technologies often taken for granted. Highly enjoyable, I found it hard to put down. I enjoyed the story, the narrator did a great job. this is one of these books that makes you want to not put it down and during the course of the narrator telling the story I found myself pausing it and going to the internet and researching different persons spoke in the story. I could definitely see myself going back to the story and listening to it again and again and this is the first time I could honestly say that. highly recommend this historical history of how the internet evolved and although I experienced many of these things as it occurred I could look back in hindsight and have a greater appreciation. ​I have to agree with most reviewers of "How the Internet Happened" is a good informational book. As I lived through that era and also being disable, technology has always been the key component in my life. I could remembered in 1994-1995, going to my English teacher (Dr. Poff) and asking him what was the Internet and how do I get on it. Ever since then, I've always been connected. If it wasn't for my high school teacher, I probably could had figured it out, but those were some exciting times, trying to dial into Netcom and Compuserve. As for Brian McCullough's book. I enjoyed the blast from the past. As a coder, the information is very mainstream and water down. It's an easy read. For someone that hasn't lived through those years, they would probably think that this book is outstanding. Even I was mesmerized the past and how far the technology has evolved of what we are experiencing now. This book is something that I would pass on to the next generation that takes their screen time for granted. While the information presented was excellent, the author left out ZDTV and Computer Chronicles. They were the first to break the news on new products and services on tv. I can remember watching PBS and seeing an episode of Computer Chronicles on Hotmail and let's not forget Compaq 486 DX. Excellent narrative, but needs an update. An excellent narrative - though it glosses over some early Internet entrepreneurs' greed, deceptiveness, and lack of business ethics. The main problem I found, though, is that it is no longer up to date. It doesn't mention recent scandals involving Google or Facebook, for example, nor Google's push to have the Internet regulated - using the false slogan "network neutrality" - to prevent competition from arising. The author should revise the book to cover these and other timely topics. Very entertaining and a must especially if you work in IT or software! I'll probably listen to it again at one point. Some of the stories in the early part of the book are interesting and have not been frequently recounted. Unfortunately the second half is a hagiography to Amazon, Facebook and Google. The author appears oblivious and downright denies the similarity in todays overvaluation of unprofitable companies in the tech world with the dotcom bubble and this detracts significantly from being able to take this book seriously. The book deals with the era that most people think of when it comes to the internet, and that's the rise of the web, although it also spends time on AOL. Overall the book is fine, having lived through this era and been the tech field I can't say it really is anything new, and it doesn't go particularly deep on anything - which is fine if that's what you're looking for. The book is written at a pretty low level, meaning it's for the mass market and is very readable for those with no knowledge of the tech, but while I don't think the author is quite a millennial, it has that smug politically correct writing style you see with millenials. Needlessly inserting politics into the book really brings it down a star, it does nothing to move the story along and is just there for the author to try to get out his political opinions, probably because he just wanted to hear his own voice in the book. Overall the book is OK, it's more a scroll down memory lane than anything of substance, and it's a good refresher in that regard I suppose. But I don't really know the value of the book for those that didn't live through the era since it doesn't really provide enough context to the era, and for those that do know the era it doesn't really tell you anything you don't already know. On the positive side the book wasn't boring, with the exception of his stupid political rants. Also the reader is fine, does a professional job. I had the ultimate audible experience with this book. I found myself sitting in my car, at my destination, just sitting and listening. Very enjoyable. This book takes an engaging look at the growth of the internet age, filled with interesting facts and back stories. A very enjoyable and well-read book.